Abram left home, just like God told him to. He took his wife with him, and all of his personal belongings. Lot, his nephew, also went with him. They all traveled from place to place and along the way Abram became wealthy. Lot also gained a great deal of wealth. After some time, there was not enough land for all of Abram’s and Lot’s herds to eat together. Lot’s herdsmen started arguing and fighting with Abram’s herdsmen. Abram proposed Lot a deal. Lot could choose which way he wanted to move next. If Lot chose one way, Abram would take the other. Lot chose a way that looked greener and nicer, toward Sodom and Gomorrah. After Lot left, God renewed his promise to Abram of many descendants and added that all the land that he saw before him would belong to his descendants forever. 1. Before starting the story, divide your class into two groups. Name one group Abraham’s camp. Name the other group Lot’s camp. 2. 2. As you are telling the story, have your adult helpers blow up as many balloons as fast as they can. When the balloons are blown up, hand them to the children and tell them to hold the balloons. 3. After a while, there are lots of balloons on each side. 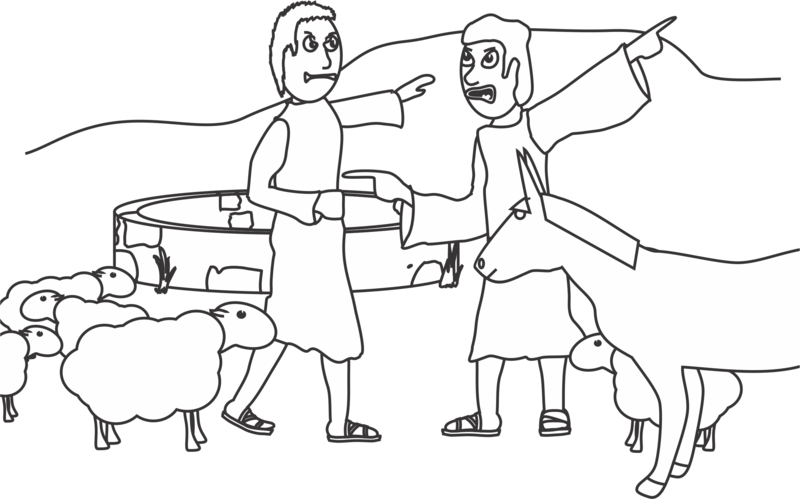 (Just like Abraham and Lot both had lots of animals.) Show the kids how quickly the balloons grew and how much more space each camp now takes up than it did before. 4. Ask the kids in Lot’s camp where they could go to find more space for all their balloons; have them move to that location. 5. Tell the kids in Abraham’s group that the rest of the space in the room is for them, just like God promised all the land to Abraham. In Joshua 1:5, God reminds his people Israel that he will never leave them or forsake them. Jesus reminds us, his children, of the same thing in Matthew 28:18-20 when he says “Go and make disciples of all nations….and surely I am with you always, to the very end of the age.” If we obey Jesus when he tells us to go, he will be there with us the entire way. He will not let us travel by ourselves or to a place where he is not. He is always with us! 1. Divide the kids evenly into two groups. Label one group “Abram” and the other group “Lot”. Have each group stand in a straight line. 3. Let Lot choose between the two options. If Lot chooses candy, then he can have a piece of candy. If he chooses the other pile, he can have one item from the other pile. Abram gets one item from whichever pile Lot does not choose. 4. After everyone has gone, ask the Lots how they felt getting to choose which prize they wanted. Ask the Abrams how they felt letting the Lots choose first. 5. If you have time after all the children have had a chance to collect one item, line them back up and switch roles! 1. Explain to the children that today you will be making passports. Abram traveled a long way, through many countries. Today when we travel between countries, we have to have a passport. 2. Give each child a light colored piece of construction paper. Fold it in half the long way and cut along the fold. 3. Fold each of the halves in half again, this time the short way. Put the two pieces of paper together so one piece is inside the other. 6. On the first inside page have the children write their name and draw a picture of themselves.